He also said he might refuse to meet Russian President Vladimir Putin, who is due to visit France next week. Last week Russia vetoed a Franco-Spanish UN Security Council resolution calling for an end to the bombing. Neither Russia nor Syria is a member of the International Criminal Court. "These are people who today are the victims of war crimes. Those that commit these acts will have to face up to their responsibility, including in the ICC," Mr Hollande told TMC. "If I do receive him [Mr Putin], I will tell him that it is unacceptable. It could also seriously affect Russia's image," the French president added. 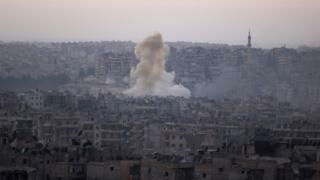 Mr Hollande's call for Russia to be prosecuted came as Foreign Minister Jean-Marc Ayrault said France was working to find a way for the ICC prosecutor to launch an investigation into attacks on rebel-held eastern Aleppo. Last week US Secretary of State John Kerry also called for war crimes charges, saying Russian and Syrian government attacks on hospitals were "beyond the accidental" and part of a deliberate strategy. It is designed to prosecute and bring to justice those responsible for the worst crimes - genocide, crimes against humanity and war crimes. So far only African defendants have been put on trial. A number of important countries seem determined not to submit to its jurisdiction of the ICC. Some have not even signed the treaty, such as the US, China, India, Pakistan, Indonesia and Turkey. Read more: What does the International Criminal Court do?